On the 50th anniversary of its launch, Apollo 7 isn't well remembered — but it continues to hold lessons for NASA today. F	F	ifty years ago, three people took a new spacecraft for a spin around Earth. It performed nearly flawlessly — so well that on the next mission, NASA decided to send people all the way to the moon. While Apollo 7 isn’t well remembered, it was a crucial mission, one that helped NASA build confidence for its moon landings. The mission still holds lessons for the International Space Station today, as NASA focuses on running its missions smoothly and safely while keeping an eye on astronaut health in space. The agency now has strict rules about quarantine, sleep periods, food, and exercise to make sure that astronauts have the best chance of staying healthy in space. Those rules came in large part due to the lessons learned during Apollo, when crews were disrupted or broken up because astronauts developed illnesses. 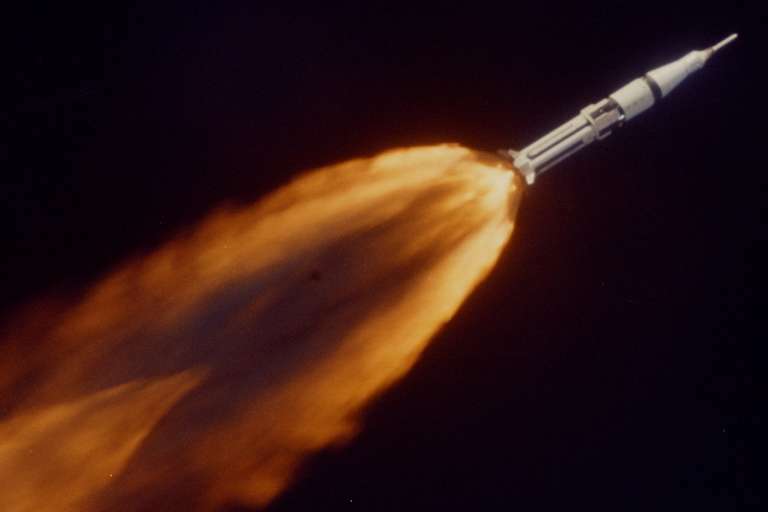 Apollo 7 launched on Oct. 11, 1968. NASA and the Soviet Union were engaged in a race to send humans to the moon, because they wanted to demonstrate technological superiority in space to the world. NASA had suffered a terrible blow 20 months earlier, when the Apollo 1 crew died in a launch pad fire during a rehearsal test in January 1967. The agency then implemented numerous design changes to the Apollo spacecraft, most notably replacing the pure oxygen environment at launch with a less flammable oxygen-nitrogen mix. 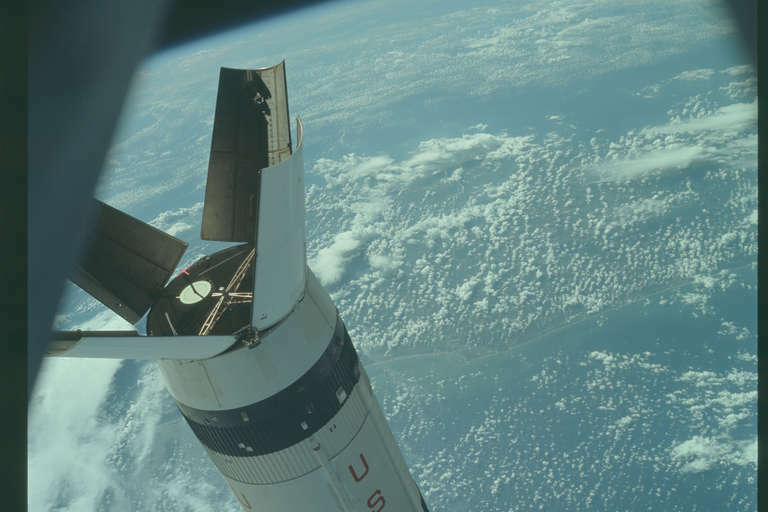 It also switched to a more advanced version of the Apollo spacecraft called Block II that had a fast-opening hatch that would allow crews to evacuate quickly in emergencies. Apollo 7's commander, Wally Schirra, flew with safety first in mind, according to Teasel Muir-Harmony, a curator at the Smithsonian's National Air and Space Museum. "He was really committed to the safety of the astronauts, and he felt a duty and responsibility to test the spacecraft," said Muir-Harmony, who’s written the forthcoming book Apollo to the Moon: A History in Fifty Objects, which highlights notable Apollo artifacts at the Smithsonian. Muir-Harmony pointed out that Schirra was also friends and colleagues with the Apollo 1 crew of Gus Grissom, Ed White, and Roger Chaffee, so responsibility weighed heavy on him to prevent similar incidents in the future. Schirra had already announced his retirement when he flew into space with rookies Walter Cunningham and Donn Eisele. But on what should have been a victory lap, Schirra quickly got into trouble when he developed a nasty cold. Accounts vary as to how many of the crew members got sick, Muir-Harmony said, but at the least Schirra's condition concerned Mission Control on the ground. Mission Control wasn't even sure how to store disposed tissues without contaminating the entire spacecraft. The situation grew more complicated from there. Schirra had been told to run the first live TV broadcast from space. He flat-out refused at first, Muir-Harmony noted, due to his illness and a concern that the crew should focus on the essentials. Schirra later grudgingly agreed to do it and the broadcast was wildly popular, but he still would have preferred to focus on the engineering aspects of the mission. More famously, the crew of Apollo 7 decided not to wear their helmets during landing because they were concerned the changing air pressure would pop their ears, already clogged by head colds. Some space historians have characterized this a mutiny, Muir-Harmony said, especially because the crew might have died if the cabin depressurized. None of the crew members ever flew in space again; some space history accounts suggest that NASA flight director Chris Kraft had vowed that none of the men would ever leave Earth again. Today, most Apollo 7 accounts focus on these interpersonal issues, which leaves aside how brilliantly the Apollo spacecraft performed during its maiden crewed voyage. 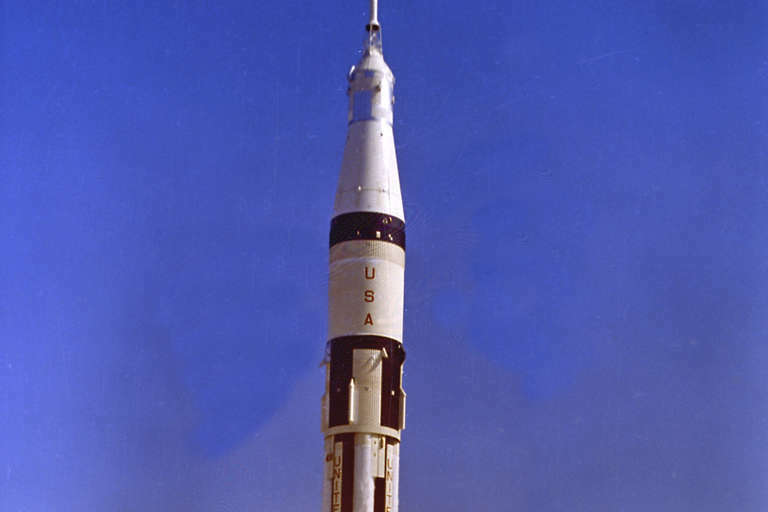 The Apollo 7 spacecraft successfully rendezvoused (or matched its orbit to) the discarded Saturn IVB rocket stage, an important simulation for docking two spacecraft in the future. The propulsion system fired several times without major incident. The crew practiced navigation procedures and took pictures of Earth much like crews on the ISS do today. One major problem in the spacecraft was condensation caused by uninsulated cold coolant lines; the crew's solution was to vacuum the water into space with the urine dump hose, according to NASA. Another, smaller health issue arose with the crew: they experienced sore muscles, but exercising with a resistance band helped relieve the symptoms, Muir-Harmony said. NASA still uses resistance exercise equipment on board the International Space Station to help astronauts stay healthy today. Overall, the Apollo 7 spacecraft was a success that made it possible for a more daring mission to the moon just over two months after Apollo 7's landing. That celebrated mission, Apollo 8, is well-remembered among space enthusiasts. The crew of Frank Borman, Jim Lovell, and Bill Anders launched on Dec. 21, 1968 and orbited the moon during Christmas Eve. On live TV, they read passages from the Bible and described the scenery below. Then on Dec. 27, the crew splashed down safely in the Pacific. Only seven months after Apollo 8, Neil Armstrong and Buzz Aldrin of Apollo 11 made the first bootprints on the moon. Americans had arrived on the moon first, before the Soviet Union — which ultimately abandoned the quest. Armstrong and Aldrin's short extravehicular activity on the lunar surface on July 20, 1969 captured the attention of millions of people around the world. To this day, Armstrong's name is still widely known among Americans. 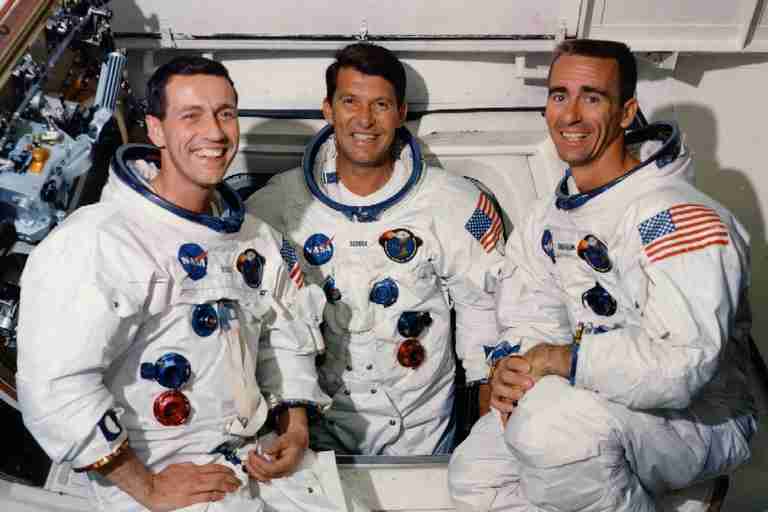 But it was Apollo 7's Schirra, Cunningham, and Eisele who helped NASA gain the experience it needed to bring future crews to the moon.